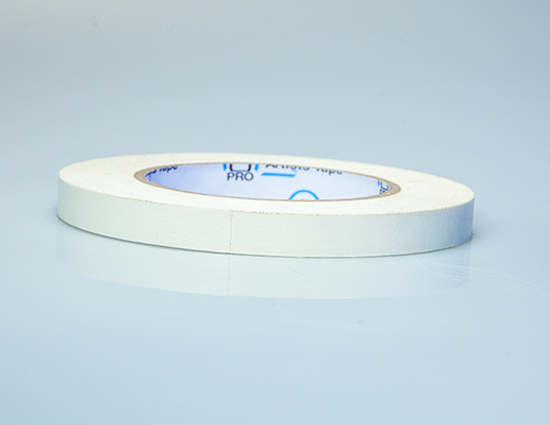 MPR Says: "Effective Paper Tape"
"Paper tape is a very reliable tool to have in your kit. Easily tape extension cords and light sockets to a ceiling or wall. The tape is strong material and won't rip or tear or leave residue. You can write on the non-sticky side so it’s great for labeling microphones, camera gear and placing marks." Pro-Gaff is a high strength vinyl impregnated cloth tape with a matte finish, available in 21 colors. Pro-Gaff has a high performance adhesive system and is highly conformable to irregular surfaces. Pro-Gaff is waterproof, abrasion resistant, and has a smooth, contolled unwind, and is hand tearable.